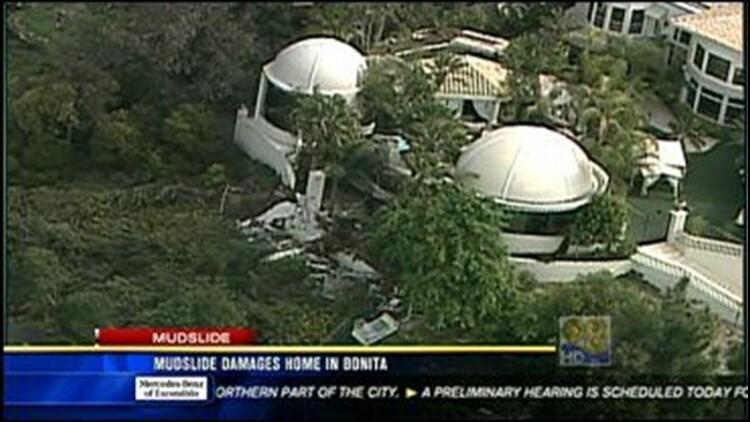 BONITA, Calif. (CBS 8) - The owners of a home in Bonita have been forced out after a hillside came sliding down in their backyard, and it may be their neighbor's fault. On Wednesday morning, the Gary Flanagan and his wife heard a rumbling and were shocked to see the steep hillside behind their home moving their way. The home -- located in the 3900 block of Timrick Lane -- has been red-tagged and surrounded with yellow caution tape, which means the family has to move out. "We just pretty much have to plan on moving out and starting our lives somewhere else for a while," Gary Flanagan said. The Flanagans say when they moved into the home in 1998 there was a vacant lot above them, but two years later a multi-million-dollar home was built with a large backyard pool and impressive dome-shaped structures to follow. The Bonita Fire Department says those later projects don't appear to have the proper building permits. Neighbors like Wayne Schmidt say it's a lesson for the whole community. "Homeowners need to be more responsible. If these guys didn't have any permits, now you can see what happens if you don't do things the right way," Schmidt said. While firefighters say rainfall, erosion or even a leaky pool could be to blame, the Flanagans are trying to look at the big picture of their big problem. "My wife made a good point last night - it could be much worse, our kids could have cancer or there could be a health issue in the family. We'll take this any time over a health issue," Gary said. In the meantime, geologists, lawyers, contractors and insurance companies are investigating the dispute that could take years to resolve. The home to the south of the Flanagans' was yellow-tagged, meaning that family does not have to move out yet. News 8 tried to contact the homeowner above the landslide, but he has not called us back.